I'm trying to catch up on posts and I have another class happening tomorrow, so I wanted to show you this Easel card that I made for my launch before I shared any more class cards. This card uses all five of our new "In Colours". I used Dapper denim for the base of this card and combined with Botanical Builder framelits, Papillon Potpourri butterfly and greeting from Rose Wonder stamp set. Colours use were the whole In colour range and some Basic Black and Whisper White to line the inside of the card. Here's a closer look at the front. It was cut with Oval Accents Bigz and Oval framelits dies. Thanks so much for stopping by. Hope you have a fabulous day. Welcome, our regular Wednesday challenge will run for 2 weeks at the Paper Craft Crew this time. Here is our sketch for this week. I've used a new stamp set here called One Wild Ride for this male card. The cardstock here is Basic Black, Cajun Craze and Whisper White. The paper on the background is from last year's specialty pack called Winter Wonderland and I've used some Washi tape from my stash for the top border of the sketch. In hindsight, the bike would have been great if i'd embossed it withe black embossing powder, however, too late now. :) Here's a closer look. 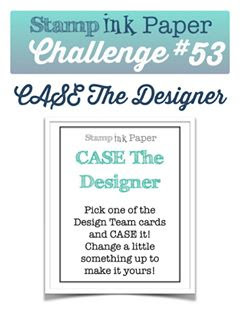 So glad you could join us this week a the Paper Craft Crew challenge. We look forward o having you play along and seeing what you create with this sketch. Welcome to our colours this week for the Tuesday Stamp Ink Paper challenge. This colour combination comes to us from Sandy and I know she envisaged Summer and tropical fruits, so please make sure you check out her fantastic card and all the cards this week from our talented design team. I liked the idea of a White card this week and incorporated Old Olive card and ribbon into my design combined with a SU Hostess stamp set called Fabulous Flora. I did not have any Tangerine Tango, so I substituted Tangello Twist ink and you may also substitute with whatever is the closest colour that you have. I love texture and used the Lovely Lace embossing folder on my background. I coloured my image with Blender pens and inks and used my Wink of Stella pen over it for a shimmery finish (closeup below) and cut it with lots of labels framelits. Decorative label punch was used with some yellow card to create a fancy edge and I also used Thoughtful banners for my greeting. When I pulled out my retired stamps last weekend for my launch I decided to use my Beautifully Baroque stamp set that I had in storage again combined with our new in colours. I've stamped here in Dapper Denim and Flirty Flamingo for this card also using the Thoughtful Banners stamps and matching punch. Cardstock used is Flirty Flamingo, Dapper Denim, Whisper White and some Dazzling Diamonds glimmer cut with Butterfly thinlits for my layered butterfly. I really quite like how this turned out, rather simple but quite striking. Thanks for stopping by. Enjoy your weekend. 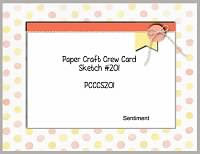 We have reached a fabulous milestone at the Paper Craft Crew team and this is our 200th challenge with our sketch below. We hope you can join us as most of the team will have some blog candy on offer, but only if you participate and comment on their blogs. Generally blog candy is available within the same Country, so for Canadian team members, its available only to Canadians who comment on their blog and in my case, I'm the only Australian on the team, so my blog candy will go to another Aussie who comments here, and so forth. 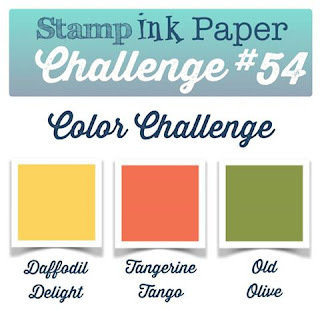 Welcome to our challenge this week at Stamp Ink Paper. I love this new designer paper I've just bought called Bloom & Bliss and thought the floral background would be wonderful with one of my favourite layered butterflies perched on top. Cardstock used is Dapper Denim, Whisper White, Sweet Sugarplum and Dazzling Diamonds and Blushing Bride Glimmer. I used Decorative label punch with greeting from Blooms & Wishes stamp set. I kept the design simple with such pretty elements and everyone knows how I love butterflies. I have a card here today that i meant to show you last month and i actually forgot all about it. A Blackberry Bliss card (now retired) base was used and I am in love with these Botanical Framelits. Mother's Day greeting is from a retired set called My Mother which was stamped on the large Very Vanilla heart and on the bottom edge of my card is a strip of marbly paper that was created with my reinkers and shaving foam. 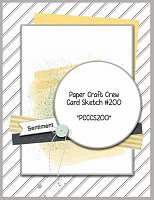 Welcome to the Wednesday card sketch challenge here with the Paper Craft Crew. Here is our sketch for the week. I've used some brand new dsp called Blooms and Bliss. I would have to say its my current favourite from our selection in the new catalogue. Greeting used on the banner is from Blooms and Wishes Stamp set and cardstock is Sweet Sugarplum, Mint Macaron and Blushing Bride. I've used my butterfly dies to create a layered butterfly on the lower corner combined with Butterfly basics stamp set. I also pulled my Blossom punch out of retirement for my punched flower. 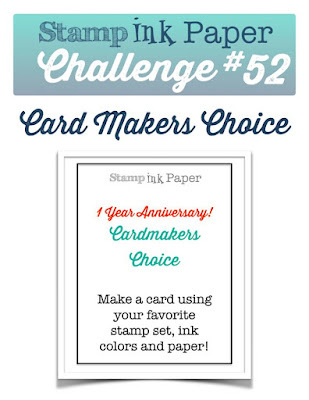 Hello and welcome to the one year anniversary of the Stamp, Ink, Paper Challenge! I wanted to share a card with you that was made as one of my Cards to launch the new catalogue on the weekend and specifically to showcase the new In Colours. Come and have a look. My cardstock for this card is Flirty Flamingo, Emerald Envy and Whisper White. Affectionately yours designer paper has been used as a panel and Whisper White background was embossed with Lovely lace embossing folder. i used my first new stamp thoughtful Banners on this card which was purchased as a bundle with matching punch Banner punch and combined it with one of my current stamps called Flower Patch cut with matching Flower Fair framelits. I stamped the flower 3 times and fussy cut the middle and top layers for a 3D effect. Below is a photo showing some more of the cards I had on display. Here's is an Easel card made for a friend of my daughter, who has turned 15 last weekend. It was my 3rd card in a row made in this style. My brief given was she likes orange, no butterflies and no flowers Mum. Here's what I finally came up with. Cardstock was Peekaboo peach, Whisper White and tangerine tango with inks of Flirty Flamingo, Crumb Cake and tangerine tango. Stamps here were Gorgeous Grunge, Work of Art and Birthday Balloons and framelits were large Numbers and Star framelits. Here's a pic of the side view so you can see how card sits. this is a closer look at the front of my card. Holly loved it and thanked me, so the effort was well worth it. I wanted to share some photos of our event from last weekend including the lovely ladies present and the projects we made on the day. My event was all about raising some money for Cancer, but we also had a lot of fun, some yummy food and some craft time. Here's the cards we made. Same card in a choice of colours with Mint Macaron and either Wisteria Wonder or Calypso Coral. I used Cup and Kettle framelits and Washi tape & Scallop Circle punch for these cards. and here is the second card we made, which was a male birthday card. I've combined a few stamps for this card, Gorgeous Grunge with Sky is the limit. Cardstock for this card is Crumb Cake, Night of Navy and Very Vanilla. I used Decorative label punch for the greeting. Inks used were Night of Navy, Lost Lagoon, Soft Sky and Crumb Cake.